Most people don’t have the luxury of a huge open garden or lawn where you can create your own garden. 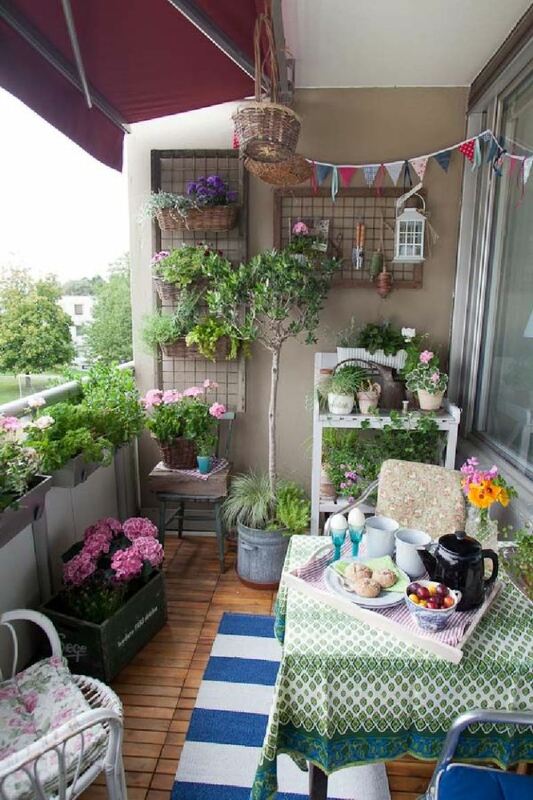 But, now you can create your own little garden space in your balcony be it big or small. Balcony garden is one such recent gardening idea that has helped a lot of people who live in a condo or an apartment with no amenities like a garden. A lot of people around the world are now transforming their balcony into a nice green and colorful garden full of plants and life. This gives hope to a lot of aspiring as well as professional gardeners. Creating a balcony garden is interesting and fun, but the most difficult part is how to get started. Before you begin, have a rough idea as to how you want your garden to look, your budget and area. Some balcony garden ideas are such that you may not need to create huge space or spend exorbitantly. The other main factor to consider is the amount of sunlight your balcony receives as this will help determine the type of plant that can be cultivated. The time you are planning to use the balcony is also important before you design your balcony garden. If you are planning to use it in the evening, then you may need lighting. With proper planning, you can design a beautiful looking balcony garden to serve your gardening needs. These balcony garden ideas describe it as a simple and rustic idea that uses the vertical space cleverly. This garden combines the rustic wood elements along with lights to create a nice warm space. You can create this garden design with scrap wood or wood pallets that can be re-used. Use these to create flowers boxes and since the design is on the wall, the floors of the balcony always remains clean and saves space too. The tea light candle brings in a lot of romance and warmth into the otherwise boring space. 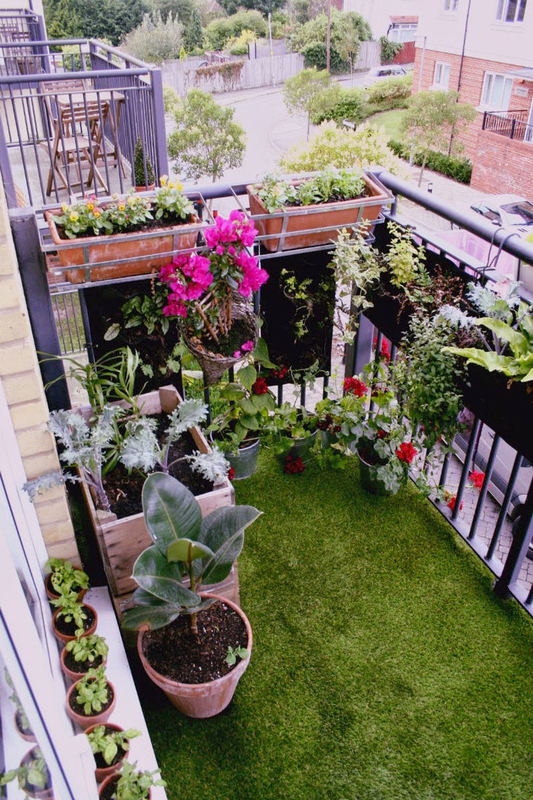 Can you believe you can have a tiny park and a garden on your balcony? You can create a park with the Astroturf that resembles a nice little lawn in a park. This colorful park on your balcony and that too in a city looks pretty. The design makes use of the wooden crates to grow some very exotic greens. You can utilize the space cleverly by including hanging garden boxes that can be used to grow flowers and plants without utilizing any extra space from the balcony. Hanging pots with plants or flowering plants allows a lot of free space in a small balcony. Just drill in some hooks on the roofs and use it to hang terra cotta pots. 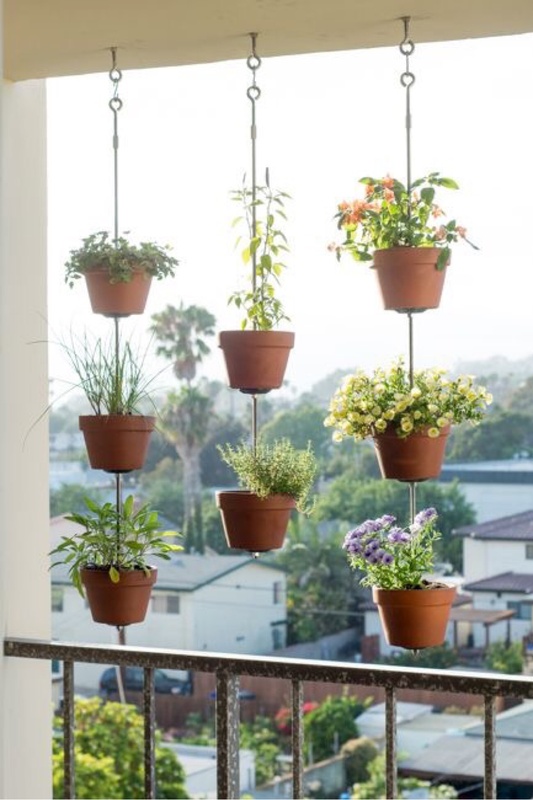 This balcony garden idea uses hooks and connects the pots using metal rods, bolts and washers. This garden has a very visual appeal; you can see it from a distance, especially if you have flowers growing on these pots. The metal rods that are used to connect the pots act as a rain chain that allows water to trickle from top to bottom. This beautiful balcony garden design is a classic example of how modern elements and comfort can be combined together. This balcony design has elements of home décor. The balcony garden is an extension of the living room with a colorful sofa, pillow and blanket. 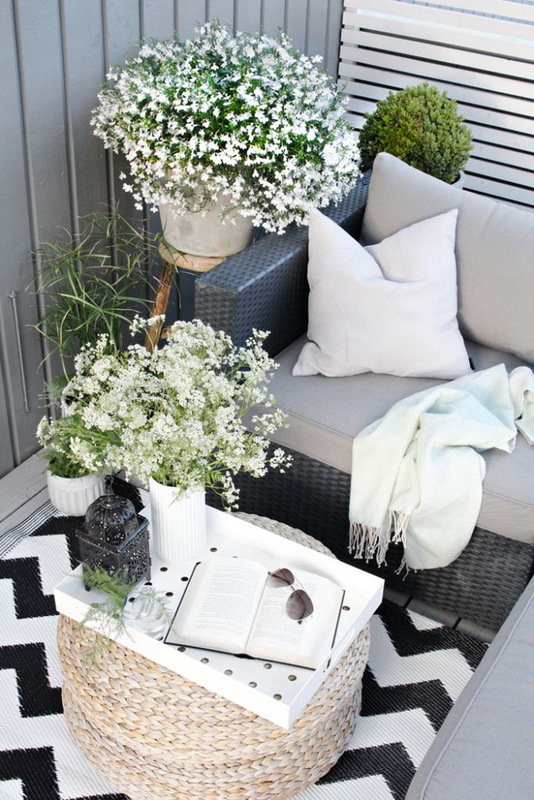 Apart from the wicker chair, this balcony doesn’t feature the quintessential garden furniture. The home décor feel is carried forward to the balcony by a stool that is used for plant display and a rope covered ottoman. Why not grow a nice kitchen garden in the balcony with herbs that can be organically grown to meet the needs in the kitchen. This is a nice way to utilize a small balcony space. 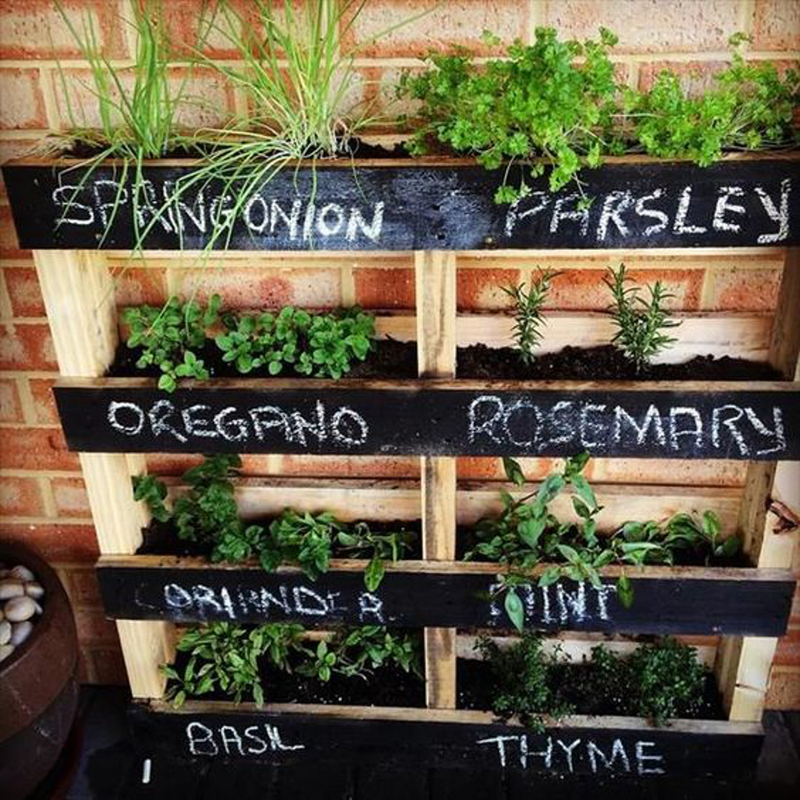 Use a wooden pallet and a chalkboard paint to create this culinary garden that is grown vertically. Drill holes below each level for water to pass through. This will prevent the plants from rotting and also prolong the life of wood. Make sure the wood that is used for making pallets should not be treated with wood preservative as it can leach into the edible plants. A small balcony can be made to look big and spacious by adding color to the garden. 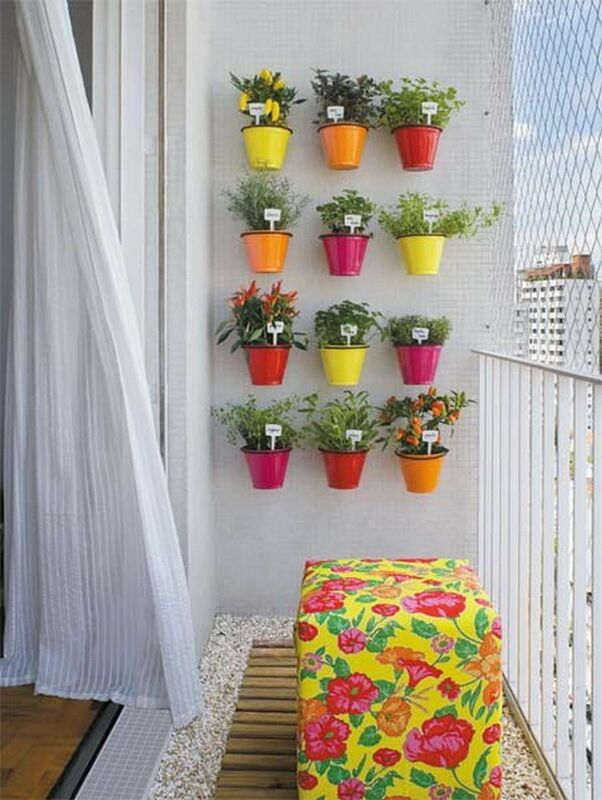 This simple looking small balcony has been transformed into a beautiful artistic space with the colorful pots. The matching plant markers keeps the plants organized without attracting attention. The wood on the balcony floor matches the flooring of the living room. The brightly colored ottoman blends perfectly with the colored pots enhancing the home décor. This is a private garden created with a creative balcony garden design. By placing the plants around the balcony edge in tall pots provides the space with a lot of privacy. Adding the pillows and blanket into the balcony, makes it look like an extension of the house. The rattan rug and the rope covered ottoman compliment the bamboo décor. The décor piece here and there creates an island feel in this private space. The wood has been nicely colored to suit the open balcony and the garden décor. 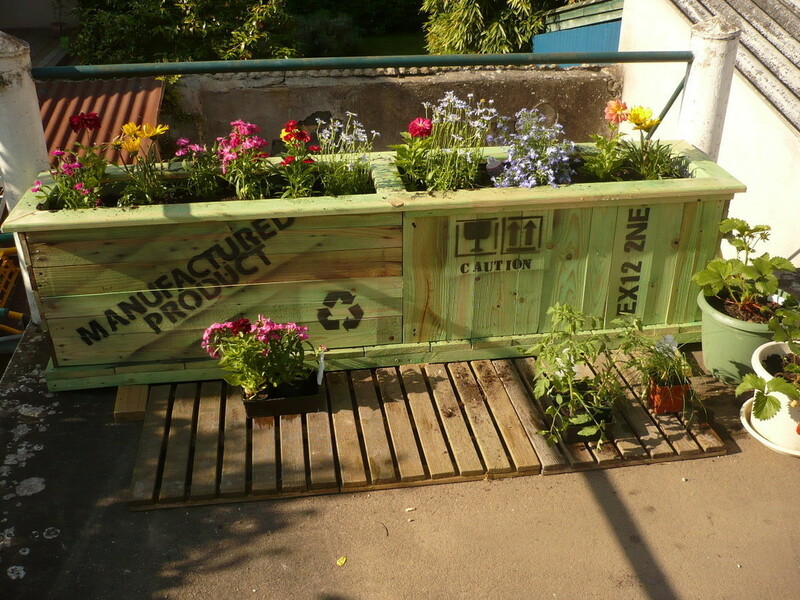 A repurposed wooden crate is used to create a raised garden here. The raised garden allows easy maintenance of the plants without bending. For the wood crate, you can check with a local motorcycle, automotive, lawn and specialty store. You can find these wooden crates at grocery stores and wine stores. This is a fully functional balcony garden. It is an extension of your home. Including some traditional indoor pieces into the space gives this balcony an indoor room’s feel. 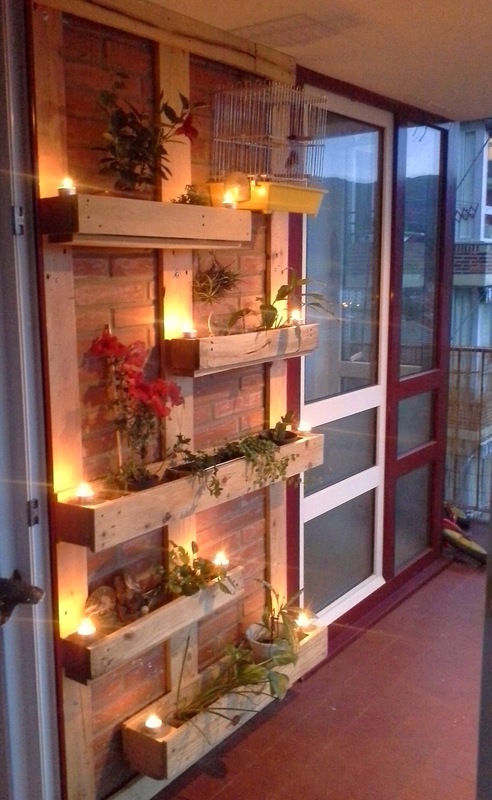 The flowers in this balcony design are grown in garden boxes and baskets. Recycled wood is used to grow exotic plants and flowers. The balcony gives you a nice homely feel because of the little furniture and décor that are nicely placed to provide the comforts of the house and also a garden. The awning gives it a tearoom ambience. 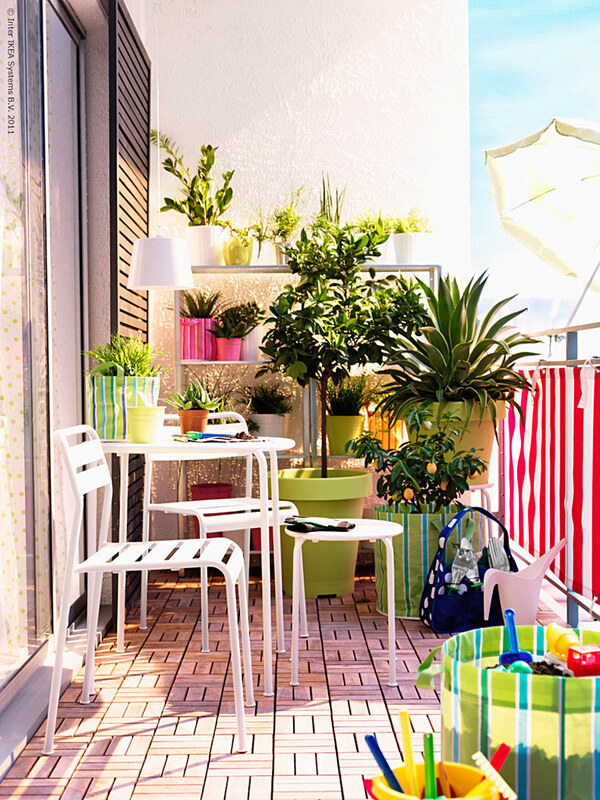 This balcony garden design is bright and sunny, a perfect ambience to grow certain plants. Fruit trees love sun, and this place is ideal to grow some of these fruits for your home. To prevent direct sunlight from hitting the pots, an umbrella is secured strategically to the balcony railing. This is a nice place to share space with a child. The hanging light over the coffee table allows the space to be used even during the night.